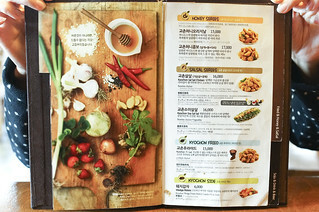 Kyochon Chicken is one of the largest restaurants that specialized in Korean Fried Chicken. They opened their first store in year 1991 and they managed to expand their business and opened 150 stores within 8 years in year 1999, and they opened branches in the USA and China in year 2007. It’s quite something isn’t it? This also gives a clue to the quality and taste of their chicken that was so widely accepted in the whole of South Korea. Actually if you see Kyochon Chicken’s Instagram photos, you would have noticed that most of the wings are in a “takeaway” packaging. 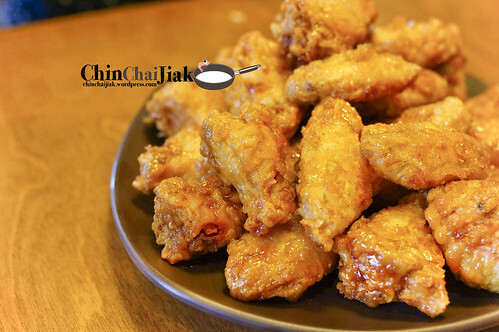 That’s right, Kyochon Fried Chicken can be sent to your residential address with just a call. Initially i planned to get them delivered to our hostel’s reception but i changed my mind as i wanted to try the fried chicken when it’s freshly out from the kitchen. 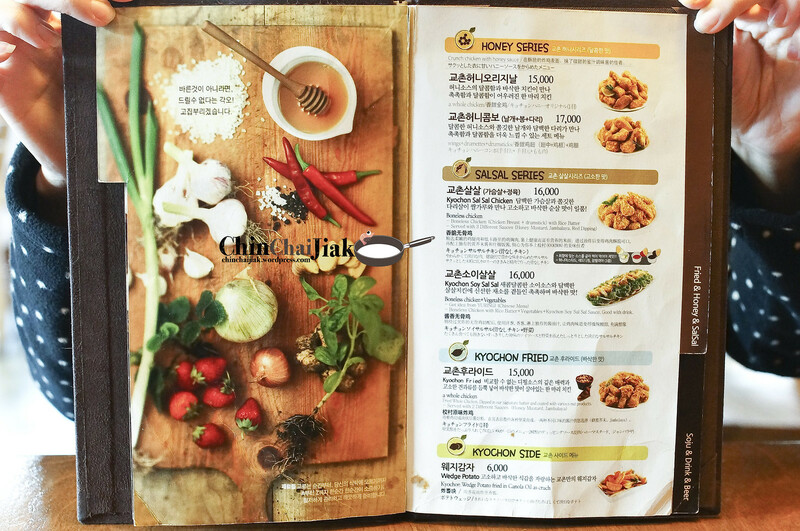 Kychon Chicken has many branches in Seoul, including Dongdaemun and Hongdae. I visited their Gangnam branch as it’s quite on-the-way. So coincidentally, this restaurant is just beside Running Man Member Gary’s Restaurant – Paljamakchang. 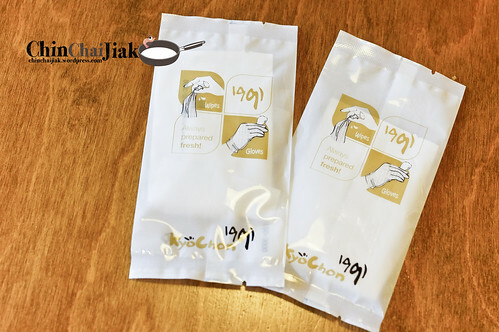 I read that Gangnam store is one of the few that actually offers plastic gloves for customers to enjoy their fried chicken. 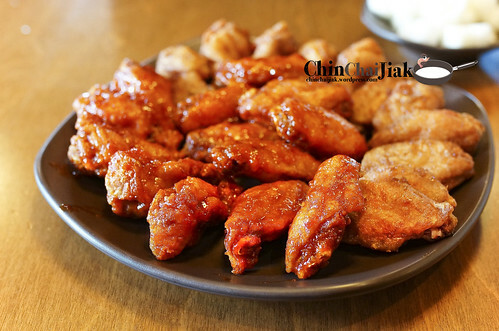 The Gangnam branch sure knows what is the best way to enjoy fried wings – using your hands! 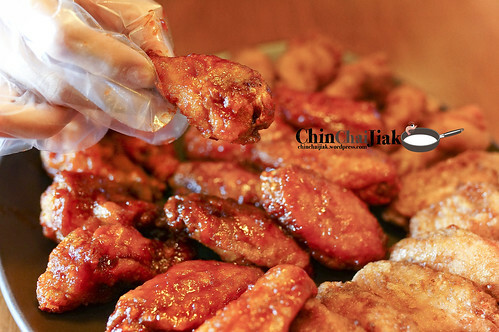 Their fried chicken comes in five flavors – Original (Soy), Red (Spicy), Honey, Salsal and a Fried Series and comes in four variations – whole chicken, mixed wings and drumsticks, only drumsticks and only wings. For a spicy flavor, wings only cost W$16,000, mixed wings and drumsticks cost W$17,000, whole chicken cost W$17,000 and drumsticks only cost W$18,000. However, there is a slight problem. Their chicken only comes in one size, which is rather big for just two people and i wanted to try out the various flavors. After checking with the waiter, we are allow to mix flavors, but only for Original and Red (not for honey, salsal and fried series). The waiter also highlighted that the waiting time is at least 30 minutes for every order as their chicken is freshly fried. I ordered the wings only version at W$17000 that comes with 12 pieces of Original (Soy) and 12 pieces of Red (Spicy) wings which adds up to about S$20.00 for 24 pieces of wings. 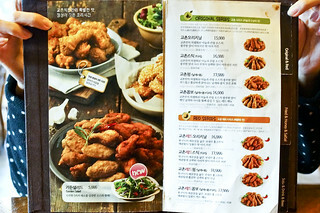 Note that Kyochon chicken’s price is slightly higher compare to their competitors, but many said that it’s still worth the price. For those who had tried 4 fingers fried chicken in Singapore. the taste of the sauce is in fact similar in a certain way, but the main difference is in the juiciness of the wings. 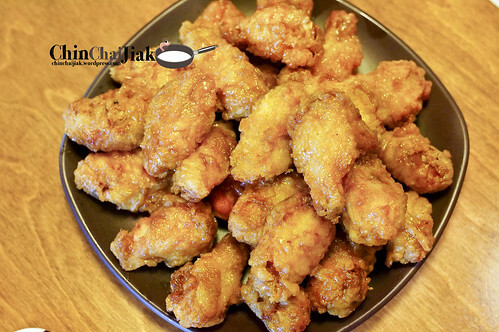 The chicken wings of Kyochon chicken is able to retain it’s juiciness and freshness despite the double-fried crispy exterior. They are also rather generous with their sauce. As you can see from the photo, each and every chicken wings are evenly and generously coated that make every mouthful really enjoyable. After finishing the 24 wings with just two of us, i felt that actually Kyochon Chicken is good, but not to the extend of exceptional. Mentally still unsatisfied, i decided to order another serving of their honey series. I waited for another 30 minutes for the honey wings, and it turned out that it’s the best decision ever! The honey series cost me another W$15000 that comes with mixed wings and chicken parts that adds up to another 24 pieces of chicken! Super burst my daily calorie intake! But then i had no regret because i had the best fried chicken that i’d even tasted in term of both texture and taste. 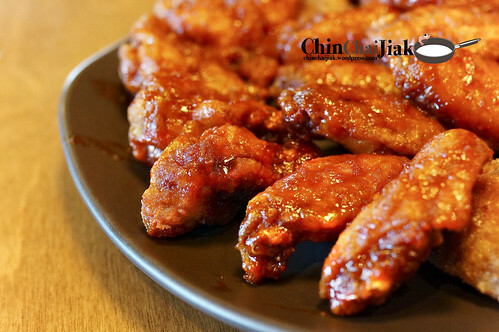 Some wings are crispy in a way that the breading is a little tough, that makes the wings’ exterior really crunchy, but it requires some small effort to munch into it. An example would be the fried Chicken Wing from Punggol Nasi Lemak, Singapore. Kyochon Honey Wing’s breading is really crispy and the breading crumbles easily with minimum effort from the jaw as I heard the crackling sound from the edge of my jaw with every mouthful. It’s light, crispy and yet fluffy, and especially enjoyable when it’s served piping hot from the kitchen. The exterior is thinly coated with honey, which gives a faint sweet savoury taste. Personally, this honey chicken actually indent an impression more than their Soy and Chilli flavour. Forgetting that I actually had 12 wings previously, I went on a fried chicken eating spree. I am really glad that I decided to try this flavor. It’s a pity that Kyochon do not serves a smaller portion like a 6 pcs chicken wings meal else I would have ordered all 5 flavours to try. Just judging on the 3 flavors that I had, Kyochon fried chicken had secured a place in my list of best fried chicken. If you ask me can I find a better Korean-style fried chicken currently in Singapore and my answer will be ‘probably not’. 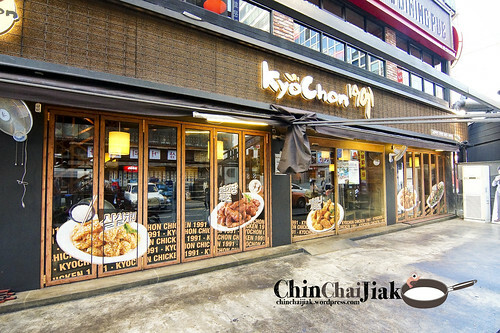 For those who are shopping at the underground shopping mall at Gangnam station, why not pop by this Kyochon Gangnam branch to see what makes Kyochon Fried Chicken so successful and popular in South Korea. Visited this place at about 3.30pm. No crowd! But crowd started coming in at about 5.00pm. 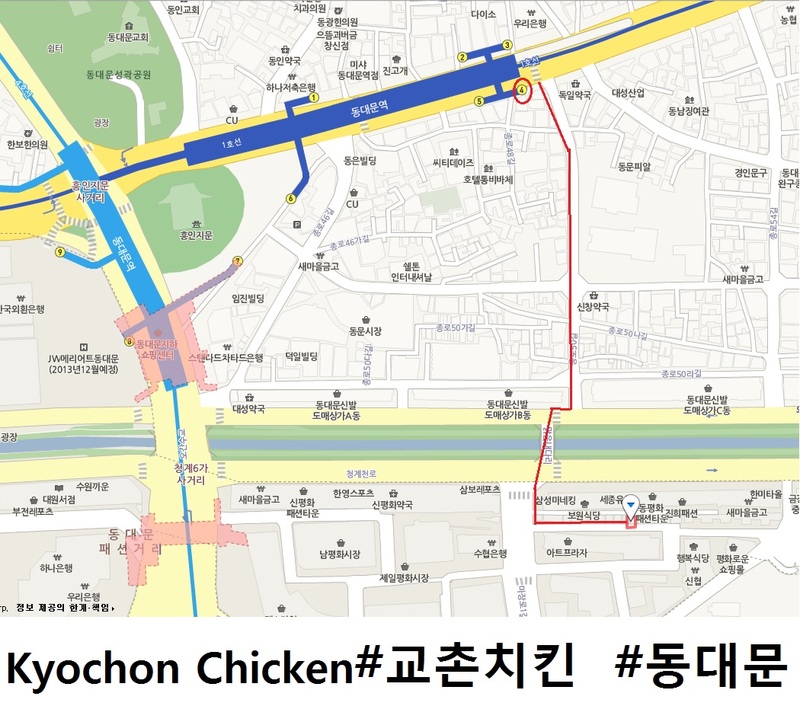 Kychon Chicken, Gangnam branch is situated in the middle of Gangnam (강남) Station and Sinnonhyeon (신논현) Station. 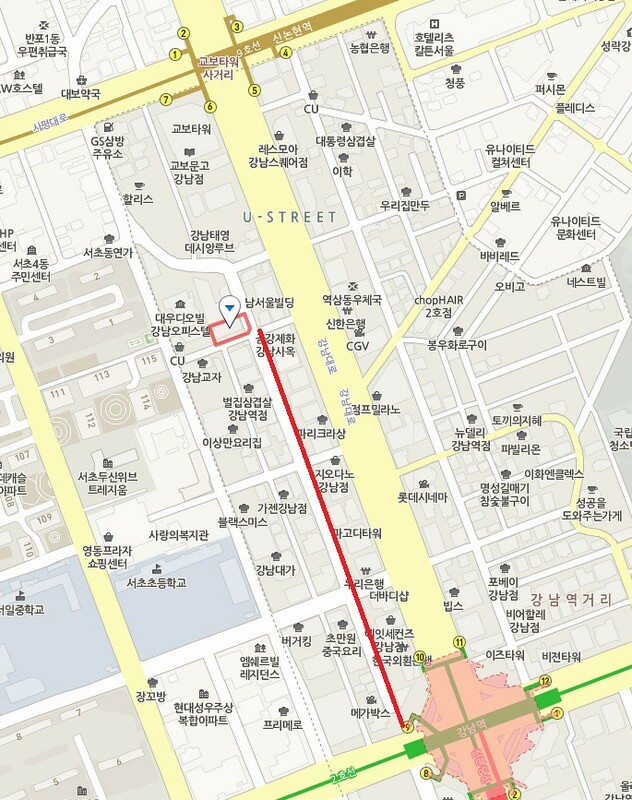 It takes about 5-7 minutes of walking from Gangnam station. 3. Continue walking straight as shown in the map and cross two cross junctions. 4. 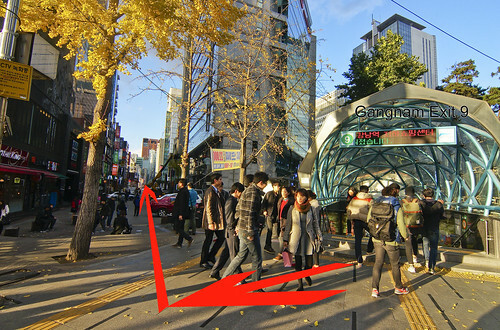 You should be able to see Kychon Chicken on your left just before reaching the third cross junction. Here is the map for Kyochon Chicken Dongdaemun branch. 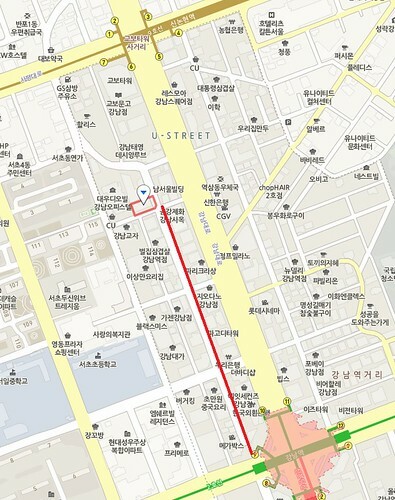 This is a map that i did up but i visited the Gangnam branch instead. If you choose to use this map, better do some basic research as i did not personally navigate to this branch before. 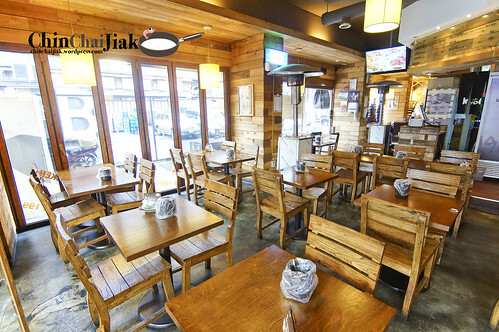 Posted in Dishes - Fried Chicken, Good For - Casual Dining, Good For - Chill Out, Location - Gangnam, Type - Restaurant Bar.